The opening act of your wedding, the invitation card, gives a prelude to what the festivities that follow are going to be like. In the following interview, Shylah Trost shares tips and explains how to create invitations cards that are uniquely you. What are the different types of wedding invitations? There are so many different styles of wedding invitations varying from very simplistic to elaborately ornate! 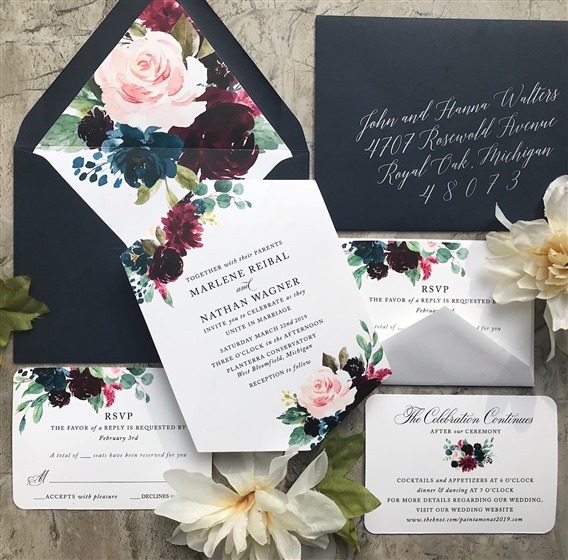 Typically, wedding invitations are printed with thermography, foil stamping, letterpress, or flat digital printing, but new printing techniques are being utilized for more ways of personalizing a couple’s vision. One of my favorite new printing techniques is white ink printing! Brides can also opt for pocket invitations, laser cut, layered, and more! 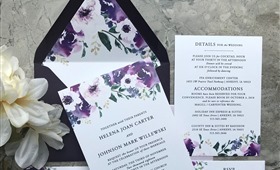 Typically, wedding invitations are printed with thermography, foil stamping, letterpress, or flat digital printing, but new printing techniques are being utilized for more ways of personalizing a couple’s vision. As we move into 2019, we’re seeing a lot of geometric patterns, the use of greenery like eucalyptus and laurel leaves, and mixed metallics like gold, silver and copper. Which are the best themes for wedding invitation cards? The best part of creating custom wedding invitations is working with a couple to highlight their own individual styles and vision for their wedding. Some couples choose very traditional and classic designs and some couples like be creative with their stationery, bringing elements of their event décor into the design through color, images, and other elements like ribbon, rhinestones, etc. As we move into 2019, we’re seeing a lot of geometric patterns, the use of greenery like eucalyptus and laurel leaves, and mixed metallics like gold, silver and copper. 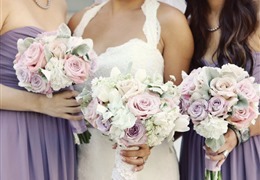 Couples are also using a wide range of colors instead of a strict color scheme. Think of the wedding invitation set as the “first look” for your wedding – a window into what style of event your wedding will be. 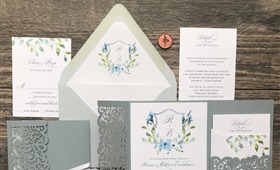 How should a couple choose wedding invitations cards? I highly recommend browsing different styles on wedding websites, Pinterest and Instagram. It will give a couple a vision for what they like, do not like, and what may or may not be in the budget for their wedding invitation set. I recommend looking online and pricing out a full set to get an idea on cost and decide from there! Once a budget is established, a couple can decide if they’d like to make their invitations more elaborate or more simplistic. Think of the wedding invitation set as the “first look” for your wedding – a window into what style of event your wedding will be. 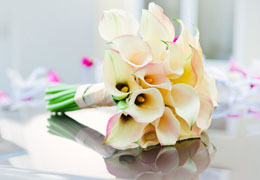 Use it as a way to introduce your guests to the style and theme of your wedding. Make it personal to you, and make it unique and beautiful! What are the best invitation wordings? As a wedding stationer, I always recommend that a couple use traditional wording styles and follow strict etiquette. That said, there are ways that a couple can put their own personal touch on their wording. At Dreaming In Paper, we offer several different versing styles to choose from and review it to make sure it is within etiquette standards. What are the best wedding invitation quotes? Love is when the other person’s happiness is more important than your own. - H. Jackson Brown, Jr.
What are the best DIY wedding invitations? Wedding invitations are extremely important documents that hold historical value over many many years. It is crucial that they be held in high regard so that they may be revered as family heirlooms. I recommend going to an experienced wedding invitation designer or company to purchase wedding invitations. To save cost, you may consider assembling your invitations yourself! 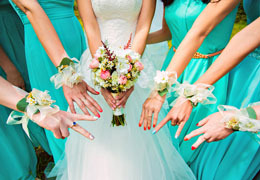 You may choose to glue layers together, put invitations into pockets or tie ribbons. Your stationer will guide you on how to assemble your invitations properly. I recommend going to an experienced wedding invitation designer or company to purchase wedding invitations. To save cost, you may consider assembling your invitations yourself! Formal is best! Determining the appropriate way to address your wedding invitation envelopes can be a tricky process and we offer a guide to help! Formal is best! Determining the appropriate way to address your wedding invitation envelopes can be a tricky process and we offer a guide to help! On outer envelopes, use titles such as Dr., Hon., Mr., Mrs., Master, and Miss when writing out your guest names. 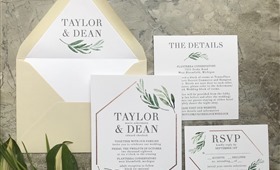 As a rule of thumb, the outer envelope of your wedding invitation should be more formal, with titles and full names, while the inner envelope is more informal, leaving out last names and titles. More and more, couples are opting to send invitations without an inner envelope, and that step can be skipped. Street names, cities and states should always be spelled out completely and abbreviations should be kept to a minimum. As a rule of thumb, the outer envelope of your wedding invitation should be more formal, with titles and full names, while the inner envelope is more informal, leaving out last names and titles. What is the traditional wedding etiquette for (mailing) invitations? Traditionally, wedding invitations are issued by the bride’s parents and they are listed first on the top of the invitation. 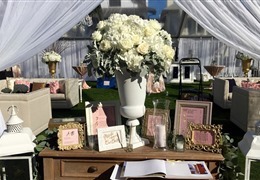 This indicated that her family was paying for most or all of the wedding and her parents are hosting the event. As we move into 2019, the bride’s parents are no longer expected to pay for the entire wedding. There are definitely parents who still do! But, more and more, couples have assistance from family, friends and/or pay for their wedding themselves. The wording used on wedding invitations can be more inclusive for all parties involved in hosting the event. 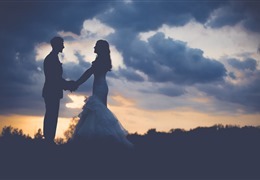 For larger weddings, we recommend that invitations are mailed near three months before the wedding and that guests RSVP approximately 30 days before the wedding. For larger weddings, we recommend that invitations are mailed near three months before the wedding and that guests RSVP approximately 30 days before the wedding. Learn more about Dreaming In Paper and see what they have to offer!